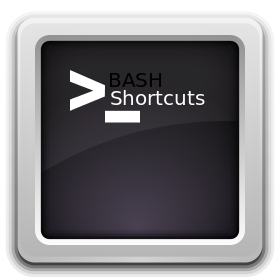 In this post, we'll show you some handy bash shortcuts. When you've become comfortable with using these (or at least some of them) your productivity at the bash shell will improve considerably! By default, line editing commands are similar to those of emacs so we'll only discuss those for now. (If you wish to change to vi style editing commands, use set -o vi (to change back use set -o emacs)). When you use the Esc key in the short cuts below, you just need to press it then release it before pressing the next key(s). The easiest shortcut and probably the most useful is using Tab to autocomplete files and folders. The rest will take a little more effort to remember. Below is a table of shortcuts, after that we present them sorted by category. So if you've forgotten the exact files and folders in a directory, TAB can help you navigate your way around pretty easily! You can also use TAB see what commands or utilities are available. For example type a letter followed by TAB TAB and you'll be given the option to see all available options. Try it with "ma" followed by TAB TAB and you'll see all command/utility options. These will include mail, make, man and a whole load of others.